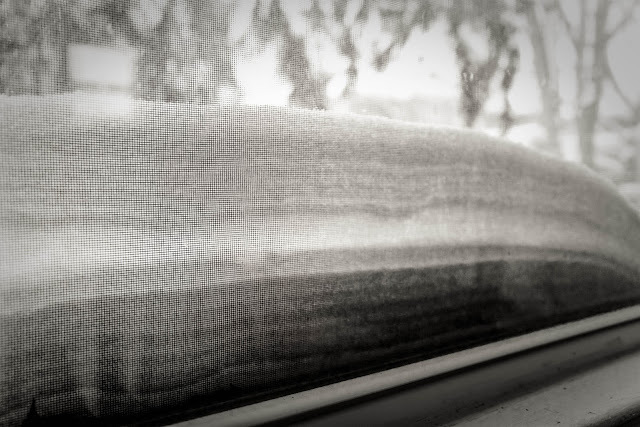 Veni, Vidi, Blogi: I Came, I Saw, I Blogged: Snow Day. This is what it looks outside our dining room window right now. That, my friends, is a LOT of snow. It's been steadily falling for a day now, and it's still coming down. We took the kids outside to play this morning and they just sat there, neck-deep in the stuff, while moaning in our general direction. When we finally rescued them, they looked like little igloos. Little moaning igloos. I'm afraid to go out there again with the kids because I'm worried that I might lose them forever. Can someone remind me why we decided to move to Western NY? Does anyone want a family of four to visit them...until April? Those with actual winter seasons need not apply. I'm SO not looking forward to our drive tomorrow - we have to wake up before the bumcrack of dawn and drive to Buffalo to meet with immigration officials. If I didn't want my Green Card so bad I would honestly think about rescheduling the whole thing. How about this. If for some reason we don't make it to our Biometrics appointment tomorrow, can one of you let USCIS know that it's because we got buried alive? Thanks. I owe you one.